So many tiny thimbles of orange juice. THERE IS ONLY one acceptable reason for not going down for a hotel breakfast. And that is if you are having it off, and it is the best having it off of your life. 7.16am Wake up, panicked, fearful that you’ve missed the hotel breakfast. What if some hound has already hoovered up the croissants? What if all the Coco Pops are gone? 7.17am Realise you’re too hungover to get up just yet, and it is actually the crack of dawn. You’ll just close your eyes for two more minu…. 9.43am ARGH! THERE ARE ONLY SEVENTEEN MINUTES OF HOTEL BREAKFAST LEFT. GET UP! GET UP! 9.46am Shuffle into the hotel breakfast room, casting suspicious eyes at everyone around you. When are they going to stop bringing the sausages out? Look at the queue at the toast rotisserie. 9.47am Wait. 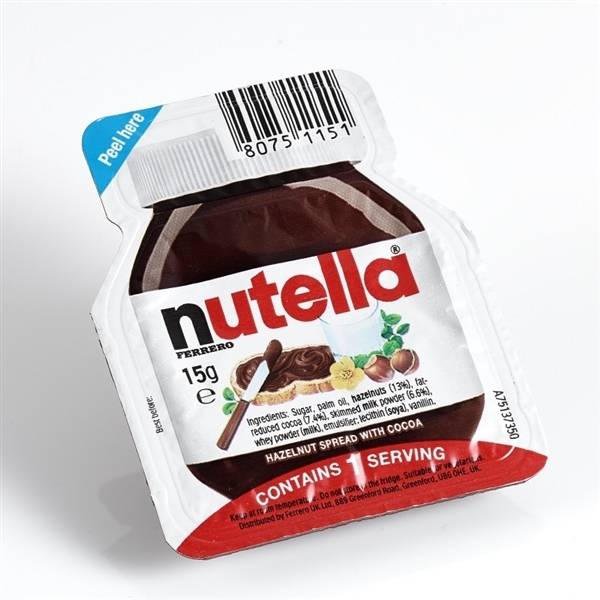 ARE THEY TINY PACKETS OF NUTELLA? Grab 7 before you do anything else, just in case. 9.48am Locate an empty table. Drape cardigan or hoody over chair as tables are at a premium at this crucial stage in hotel breakfasting. Turn teacups over, indicating that you are ready and willing to accept tea. Head for buffet. 9.49am Grudgingly place fruit in a bowl. Give serious side eye to people who appear to be having Alpen and nothing else. Choose a yoghurt, knowing full well it will never ever be eaten. It probably has bits in it anyway. It’s just for show. 9.50am Pile several mini pastries on top of poxy fruit. Four maybe. Any more is too greedy. Any less is a fool’s errand. 9.51am Deliver fruit, yoghurt and pastries to your table. Return for two tiny thimbles of orange juice. Briefly consider grapefruit juice, and then catch a hold of yourself. 9.52-9.56am Consume all four pastries and one grape. Return for three more thimbles of orange juice during this time. Maintain a close eye on hot food section to ascertain if they’re about to cut you off. 9.57am THEY’VE JUST RESTOCKED AT LEAST TWO OF THE SILVER MYSTERY TRAYS! GO! GO! GO! 9.58am Beat at least two other guests to the first silver mystery tray. Open with trepidation. Mushrooms. PAH! Next tray please. 9.59am SAUSAGES! Dear Diary, jackpot. Take three. Move down the line, accepting rashers, one of each coloured pudding, slithery fried egg. Reject beans on the grounds that beans should never touch the rest of a fry. 10.03am Deliver plate of hot breakfast to the table, ignoring death looks from hotel staff who want to start clearing up. Smugly observe people who have arrived too late and are faced only with fruit and muesli and a few bits of toast if they’re lucky. 10.04am Return to toast rotisserie. Join queue. 10.05am Restrain self from breaking arm of person in front of you, who is taking an insufferably long time to apply the toast to the toast conveyor belt. 10.06am Finally it’s your turn. Take an insufferable long time to apply the toast to the toast conveyor belt. Feel the eyes of the person behind you bore into the back of your head. Turn and smile nervously at them, throwing eyes to heaven in a “the things you do for toast, eh?” kind of way. 10.07am Toaster spits out ‘toast’. It is pale and anaemic. Throw ‘toast’ back into toaster, ignoring audible sighs from the queue. 10.08am Retrieve toast. Pile some brown bread and two round rolls onto plate, just in case. 10.09am Return to table. Dig in. Panic about not having enough toast. Consider returning to the rotisserie, but make do with brown soda and one of the rolls. 10.13am Feel a bit sick. 10.14am Casually stroll back up to the silver mile of trays, hoping for a stray sausage. Return to table, defeated. 10.15am Head back to room, consumed with fear about clashing with the housekeeping staff. 10.17am Arrive onto your corridor. Note that the cleaning trolley has already been and gone past your room. Breathe sigh of relief. Today will be a good day. Email “24 stages of negotiating a hotel breakfast buffet ”. Feedback on “24 stages of negotiating a hotel breakfast buffet ”.